40th anniversary giveaway: £20k of prizes are on their way to 42 winners | What Hi-Fi? Congratulations to all our winners who should by now have been notified of their prizes. If you're wondering if you were one of the lucky winners in our bonanza 40th anniversary competition, all 42 winners have now been notified and their prizes should be winging their way to them shortly. If you didn't win, don't be disheartened. There's still time to enter our latest giveaway in which you could win an amazing £8000 Chord DAVE digital-to-analogue converter. To enter the Chord DAVE competition, just follow the instructions on this link. Good luck, and once again congratulations to all our 40th anniversary winners. Nothing says "40 glorious years of What Hi-Fi?" quite like a unique turntable, so we've teamed up with our friends at Rega to make our dreams a reality. For a chance to win a limited-edition What Hi-Fi? 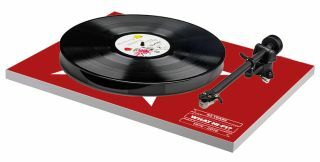 40th anniversary P1 turntable, or one of dozens of other prizes from companies as generous as Arcam, ATC, AudioQuest, Chord, KEF, Q Acoustics, Sennheiser and Yamaha (to name but a few), just answer the simple question on the form by clicking on the link below. (Hint: to find the correct answer, you'll need a copy of our special 40th anniversary issue of the magazine, which will be in the shops from 1st September. Subscribers should get their copies this weekend). And to see exactly what other prizes we have on offer in this bonanza giveaway, keep scrolling down the page. Terms and Conditions: 1. Fill in required details and click on the submit button. 2. Entries close 11.59pm, Friday 30th September 2016. 3. Prizes are as stated. 4. Open to UK residents aged 18 or over 5. No cash alternative and prizes are non-transferable. 6. Only one entry per person. 7. Individual winners will be listed at random for each listed prize. 8. Where applicable, prizes maybe subject to additional terms and conditions as provided by the prize supplier, and must be agreed to accept the prize. 9. For full terms and conditions click here. The Promoter: Haymarket Media Group, Bridge House, 69 London Road, Twickenham, TW1 3SP.